When you find a dent on the panel of your vehicle it is important to make the right decision when searching for the best method of dent repair. Some are better suited for the more traditional repair using filler and respraying the panel when other dents are better suited for the paintless dent repair method allowing the repair to be carried out without having the compromise the original factory finish on your vehicle. There are many factors that will guide you in the right direction. All makes and models vary with differing strengths to the panels as well as different bracing points. Sometimes the dent may tick every box when it comes to paintless dent repair but then you just can’t access it due to the bracing behind the panel. In this case there can be other options available such as glue pulling but this is not always an option and each dent/vehicle needs to be assessed on an individual basis. As panels are always thicker near the edge due to a double skin being necessary to ensure extra strength where it is needed most this can make a paintless dent repair near impossible.These are just some of the things to look for when arranging a quote for dent repair. There are many causes of Paintless Dents with the most common cause being shopping trolleys. Other peoples car doors, hail and a small incident with another vehicle can often lead you to search for the best dent repair option. Trying to photograph the dent for quoting can be tricky and even when it comes to repairing them some dents seem to hide from you no matter how hard you search. This is why the technicians use a light board (as seen in the photo provided) to make the process far easier giving the customer the best finish possible. With paintless dent repair being the sensible first choice there are times when there is no option other than using filler and respraying the panel. The list of criteria is a little broader when it comes to your traditional dent repair method with the direction of questions changing. While every effort is made to minimise the amount of filler used in the repair it is still required to ensure a quality undetectable finish. 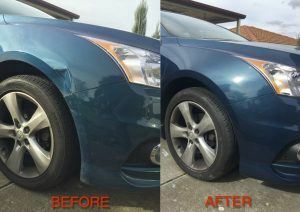 There are times where paintless dent repair seems like the perfect option but you will still be directed to the traditional method for various reasons. Once reason could be that the metal panel has been stretched from the impact that caused the dent. e.g. sporting balls such as golf and cricket balls. In these instances it may look like a paintless dent repair on the surface but in actual fact will require filler as the dent cannot be pulled back into place without falling back into the damaged form as a result of the impact. It is just best to be well informed so you are making an informed decision that is best for you, your vehicle and your pocket. This entry was posted in dent repair. Bookmark the permalink.